Reagan slept well last night (although still a bit restless)! She woke up smiley and happy this morning. 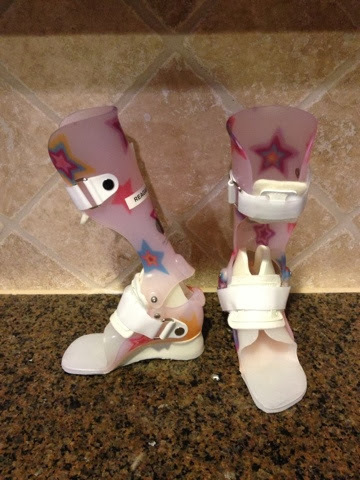 She had OT & PT today, followed by a trip to get fitted for and pick up her new AFOs! They look a little different than her old ones, so hopefully they will work better for her! She is still very crunchy, with her hands tangled up in her hair at all times! She's also still very congested! We resorted to saline and nose suctioning today, which helped a little to get it breaking loose, but she insists on breathing through her nose so she sounds like a snoring old man! She has brother to thank for this (he's still coughy & snorty!) I'm so ready to be done with these persistent colds/"allergies"! Hoping for a nice relaxing weekend...next week is going to be a long one with a 24hr EEG scheduled Thurs/Fri! Reagan slept well last night and then woke up this morning still pretty groggy. 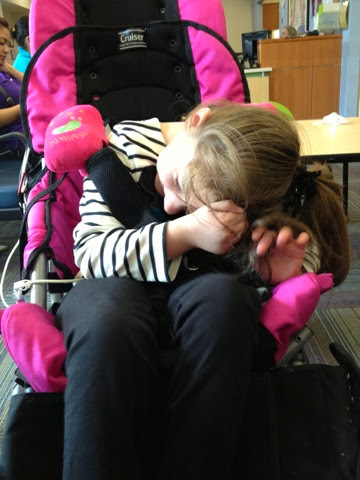 Her nurse changed her and then she promptly fell back to sleep! She continued sleeping...the ENTIRE DAY! Slept though diaper changes, position changes, blood draw (for epi-743 study & endocrinology labs)...it didn't matter! She was OUT! Now, she was restless and would toss and turn throughout the day, but her eyes stayed closed! That girl was tired!! Then tonight, around 7pm, her brother's fussing finally woke her up! I picked her up and brought her downstairs but she was still tired. Very crunchy, hands knotted up in her hair constantly, but her eyes would be open, then closed, open, then closed. Finally around 10pm she dozed back off, snoring away! She's VERY congested. Whatever upper respiratory disturbance her brother had, she now has as well! I guess you can only be coughed on and sneezed on so many times! Hopefully she'll sleep well tonight and have some good awake time tomorrow! Reagan had a good day today. Sleep was OK. I woke up at 2am and found her completely sideways in bed! I straightened her out and tucked her back in and she went back to sleep. She woke another time or two but then slept in til 9am this morning. She woke up laughy and sweet! Still a little kooky and definitely not a fan of us talking (and very congested), but otherwise good (and no nausea)! She had OT, speech, & school today and did really well with them all! Tonight she was so cuddly and sweet! Love this girl! 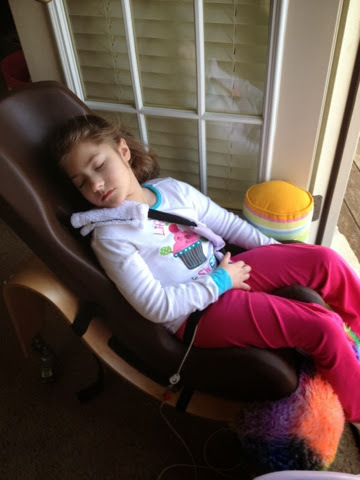 Reagan slept in her chair last night beside our bed (just in case she got nauseous). When we first put her in it she started freaking out! Turns out it was positioned right under the A/C vent and apparently she was very sensitive to that! She was very restless but she did sleep off and on. Then around 7am the laughs started and they continued all day long! These were good laughs...albeit a little crazy at times! The only kink in her day was the nausea. She had a couple big throw ups during the day, but thankfully none tonight (although she was still a bit spitty/chokey)! She was super snuggly though so that was nice! Right as we tried to lay her down, she did get a burst of crazy energy and we were afraid she might freak out and not sleep, but she did eventually settle down and doze off! Sweet dreams my sweet girl! 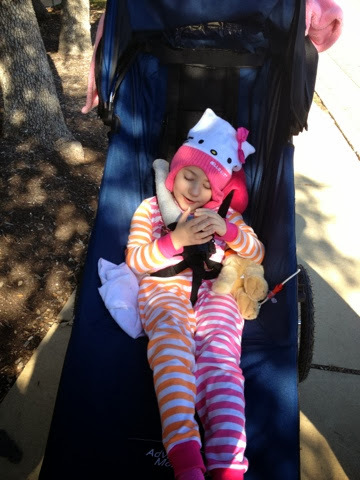 Reagan slept fairly well last night (in her chair), but she was still pretty restless. Many times I'd look at the monitor and she'd be moving around, but then she'd stop and appear to be sleeping again. She's been a little less irritated today, but definitely more zoned out and sleepy looking (without actually sleeping)! She had a big, huge throw up just after noon and then a few more as the day went on. Poor girl, you can just look at her and tell she feels miserable! I'm pretty discouraged to see the nausea return! I was hoping that between the round the clock Zofran and increasing her nortriptyline back up we would skip over the nausea this go round, no such luck! Please keep her in your prayers! I'm so ready for this bad streak to be over! 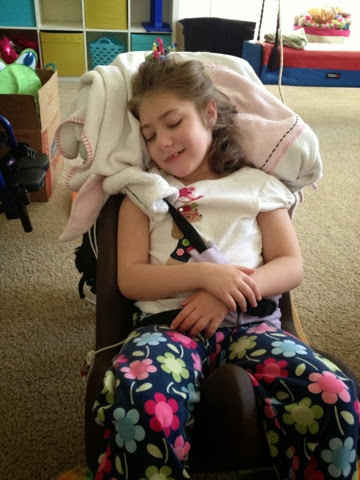 Reagan slept well last night (in her chair), but she's still not better. Today she's been a lot less sleepy, and that's not necessarily a good thing. She's been very tense, still congested, having lots of chorea, and still hating diaper changes. Very stressed. She's also been showing symptoms of nausea/reflux...hiccuppy, burpy, with a lot of mouth movements. Hoping for a better day tomorrow for my girl! Some smiles would be nice! Reagan slept well last night. Ryan was up by 6am, but what can you do, we've been up ever since! Reagan has had some good and bad moments today. She's had some congestion in her nose, I'm hoping she's not catching Ryan's junk! She's really hated being messed with...diaper & clothing changes sent her over the edge every time (and I mean crying and holding her breath til she turned purple)! But the oxycodone has done a decent job in controlling her pain and helping her to rest. And having Grandma here has been helpful as well! 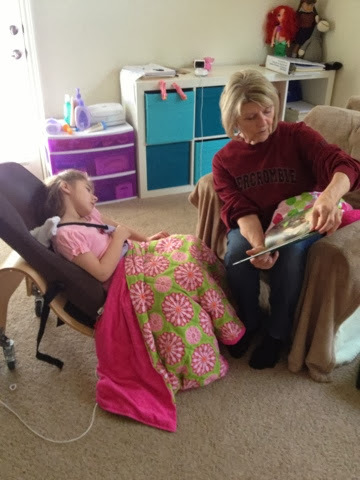 She read to her until she fell asleep...so sweet! Ryan was enjoying his time with Grandma as well! He went for a walk to the park and jumped on her bed until he couldn't jump anymore! Hopefully everyone gets a good nights rest tonight! Reagan slept in her bed last night but woke up very upset at 6am! We moved her to her chair, but she was so upset, I was thinking we might be in serious trouble today! I gave her a dose of oxycodone and she calmed down, but didn't fall back to sleep. She was still giving us (crazy) laughs here and there and tense but quiet. She wasn't great with therapy or the iPad today, but as long as we kept it low key, she was good and even took a couple of naps. All in all, this wasn't such a bad bad day! I'm hoping maybe the medication really is curbing it a little and we'll see improvement across the board! Tonight when I changed her, she immediately fell asleep in my arms! Such a sweetie! Brother is still coughy and sneezy/runny so we're having to keep them separated. Praying he gets well soon and that Reagan can avoid catching any of his gunk! It's been a bit of a weird one today! Ryan woke up crying at 4am and then wouldn't go back to bed (now he has a junky cough in addition to the runny nose)! 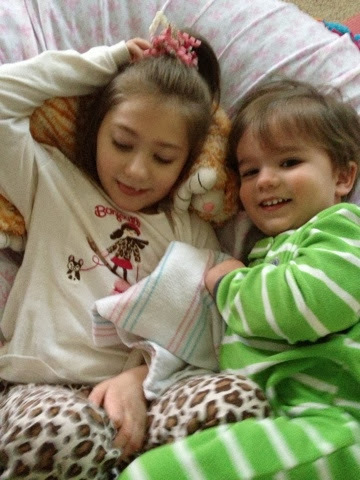 Reagan woke up at 6am, I think on account of her brother's fussing! She was happy, but no one was going to get any more sleep! Reagan has had her ups and downs today. Most of the time she's been calm and sweet, but she's also been easily excitable, not a fan of talking, and having what we think were tummy pains (lots of gas)! It's definitely a day on the decline...better than we thought it would be (today is day 11 of the cycle)...but not as good as previous days. So tonight I went ahead with the first dose of Zofran & Oxycodone. It's our hope that by treating her before the bad days start, that we'll be able to stop them or at least lessen the severity. That's the idea anyway. We'll see how it works. Hoping and praying both of my babies get some sleep tonight!! Reagan slept OK again last night, but she was up early again! 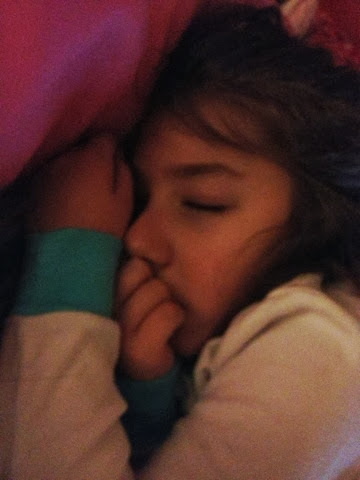 When I found her this morning she had her tube wrapped around her arm and had obviously tugged on it a bit because her shirt was wet from leakage around her tube! She's been a sweet, smiley girl again today. Spunky and a little vocal at times, but still relatively laid back most of the day. We're still having ongoing pee issues. Yesterday she only went twice and today three times...not sure why we continue to have issues in this department! After she speech therapy at noon we decided to make a trip to the new Austin Aquarium which is only about 10min from our house. 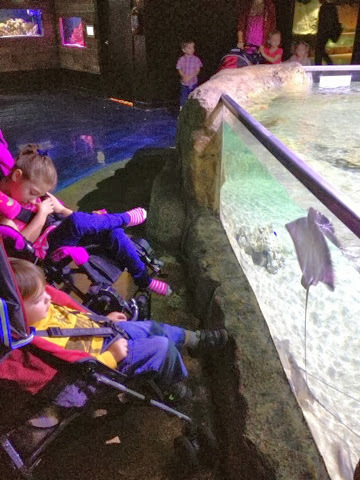 It's by no means up to regular aquarium standards, but it's so close to us and there are quite a few ground level tanks where Reagan was able to get a good view in to see everything (and we bought family passes at half price)...we're definitely going to try to go as often as possible. Reagan and Ryan both seemed to enjoy it, but Ryan was a bit of a challenge because he had missed his morning nap and has a sniffly, runny nose that's driving him crazy! We only stayed about an hour, but we all enjoyed ourselves! It's nice to get out and do things (especially so close to home)! 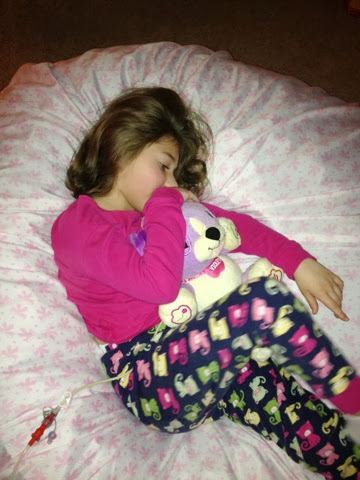 Reagan fell asleep last night on her own and we were able to lay her in her bed despite her horrible nausea. She slept well until 4am or so when she woke up and started making some noise. She dozed back off for a little while, but seemed awake for good by 6am so I moved her to her chair. No signs of nausea this morning, so that was a very good thing. I spoke with her GI doc and he agreed that we should go back up on her nortriptyline dose (to try to stop some of this awful nausea)! Hopefully it helps! This morning Reagan had an early session of OT that went really well, but then she dozed off for a bit. Vision therapy and PT came at 11am. She was still asleep but PT got some good stretches in and Reagan did eventually wake up! Then we headed in for her swallow study. She was really crunchy again today, so they had to tie a sheet around her under her arms just to keep her upright. She did not do well with any of the liquids, there was some aspiration, but she handled purées well. Then we came home and she took a nice long nap! Tonight she was awake and snuggly. Love this girl!! My crunchy girl (hands knotted in her hair at all times)! Reagan slept well last night but she was awake and vocal by 6am. She's been a super sweet and smiley girl again today (less sleepy)! Still very "crunchy" (looks like she's constantly doing abdominal crunches) with her hands knotted up in her hair nonstop! She had OT, speech, & school/speech today and did really with everything! Then tonight, out of no where, the nausea started back up. Big throw ups, lots of clear foamy fluid, no idea where it's all coming from!?!? Poor girl! She'll have a huge throw up and then just smile from ear to ear! Sweet girl. We are definitely going to have to make some changes! I don't know if this increase in nausea is from changing her formula or lowering her nortriptyline dose or both, but something has got to give! Tomorrow afternoon she's supposed to have a swallow study (we scheduled it over a month ago) so we really need this nausea to be gone by morning. Please keep her in your prayers and pray for some direction on what we need to do to help alleviate her nausea! Smiling during a cat nap this afternoon! Yesterday Reagan slept off and on throughout the day but her body was still very tense and when she's wake up, she was still very stressed (until right before bedtime). Today she has been sleepy, but wonderful. She slept well last night (I don't think she moved a muscle all night). Ryan, on the other hand, must have sensed that we were sleeping soundly, so he woke up crying! We put him in bed with us where he promptly stopped crying, but then just wanted to play! We eventually got him back off to bed (he was not happy about it) and we got back to sleep! Reagan slept in this morning, but woke up when she had a huge pee (thank goodness)! She was a little crunchy (hands up in her hair a lot), but all smiles! She didn't stay awake long, she fell back to slleep and slept until the next pee. She didn't really wake up until tonight! She cuddled with Mommy and was awake til about 11pm. So thankful to have our girl back again! Praying for many good days ahead for her!!! It was an awful night last night! Reagan was super nauseous (but no actual throw ups) and unable to go to sleep yet again! She was so tense and so agitated, she kept rubbing at her face, but when we tried to restrain her she really freaked out. What made matters worse...we're still nurseless on Saturdays! Poor Reagan was so chokey and tense...her resting heart rate was in the 160's (and that's without a lot of chorea). It was awful! She would doze off and on but usually only when being held! But each time she would wake up just as stressed and just as gaggy as before! And another major issue...no pee! Her last wet diaper was from the night before the last! That's over 36hrs without a single pee! I tried everything, but she wasn't budging! Finally, she dozed off tonight and seemed to be more calm (I even got a smile)! I moved her to her bed and just as I laid her down I noticed she finally peed (and leaked thru her pants onto her bed of course)!! I've never been so happy to see a pee!!! Praying for restful sleep and upcoming good days for my girl!! It's been another chorea filled, nauseous, laughy day! Sleep wasn't happening again last night. I'm pretty sure she didn't sleep most of the night. She was having so much chorea, she was also super swipey with her hand, so I had to pin it down to keep her from rubbing her face off! And then the crazy laughs started and went on most of the day! She wasn't super nauseous in the morning, and laughing seemed to keep her mind off of it, but as the day went on, the laughing decreased and the nausea increased substantially! She was very spitty and was having a hard time managing it! 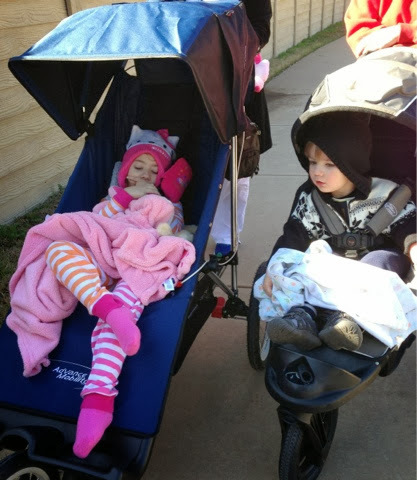 She suffered through PT, speech, & OT but not much was accomplished in any of the therapies. Just an all around stressful day (for everybody). She's also holding her pee again! Only one wet diaper all day and that was the one she had first thing in the morning! Tonight it wasn't looking good for sleep but she just dozed off so we're praying she stays asleep! Hoping for a good/sleepy day tomorrow (with NO MORE nausea)! Reagan didn't sleep again last night! She was still very nauseous so I switched her over to pedialyte. Unfortunately, the chorea continued and she was unable to get much, if any, sleep! The chorea has been relentless today. She wasn't really nauseous at all during the day. She's been pretty serious most of the day, with the occasional frustration/fussing but I think she's just agitated with her body! We tried giving her clonidine to calm her down, but it didn't do a thing! This afternoon we had another care conference with Reagan's doctors...this one we were actually invited to! 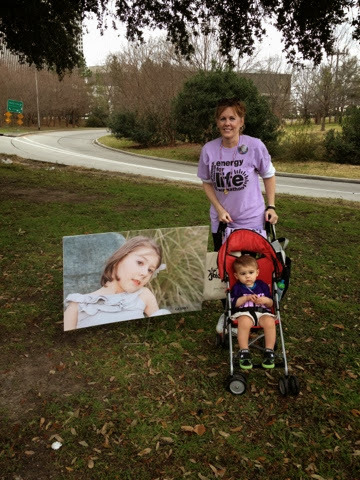 Unfortunately her neurologist didn't make it and her GI doc was very late, so it was really just us, palliative care, and the metabolic doc most of the time. He did go over the graphs that I had made (from Dec-now) and concluded that Reagan is on an 11day pattern. We also talked about getting her into endocrinology for a precocious puberty workup and labs. Once GI got there we came up with the plan for the month! (Neuro got last month, when we tried Lyrica, which we're currently weaning her off!) We're going to try to be proactive and when we see the bad days getting closer, we're going start her on round the clock Zofran and hydrocodone. Get the pain and the nausea all at once. Hopefully it works...and if it doesn't, we'll try something new! Tonight Reagan is still having crazy chorea, the nausea has started back up again (but no throw ups), and shes had the crazy laughs! I dont see her settling down any time soon! Please pray that my girl can get some sleep tonight! She desperately needs some rest and relief from this nausea! Reagan did not sleep last night. She dozed off for just a bit with the help of clonidine, but I think that was about it for sleep. Lots of chorea last night and today. Very tense. I definitely think she wanted that stupid tube out, but she did not really calm down after removing it at 10:30am. She did however do well with a joint speech/vision therapy at noon and then her teacher coming this afternoon. The nausea has continued today, only there have been quite a few throw ups (increasing in frequency and volume tonight). It's definitely a sleeping in her chair sort of night (and I'm switching her over to pedialyte as well). As of now, she can't seem to calm down and be still long enough to doze off...and when she's nauseous, sleep is the only thing that seems to help! Ugh. It's so hard to watch! Please pray that she can get some relief as soon as possible! It's been a tough day for my girl! Thankfully she slept well last night! We were able to put her in bed on her side and she slept until 6am. I found her kicking around so I moved her to her tomato chair and I just stayed up (she can't be trusted with this tube)! Today she's been tense, nauseous (with several throw ups), and wanting to wipe at her nose nonstop! She's gone through periods of extreme agitation, but no real crying. We've had to either restrain her or hold her arms all day (and she's so quick and strong, it's a difficult task)! As of this moment (11:24pm), the tube/probe is still in. We had a little mishap with the tape, it's peeling off under her nose and making her crazy, as well as making her neck really red (although we actually think it was the tube rubbing)...anyway we have it secured as best we can and hopefully it will stay put til noon tomorrow! I just want to finish this and pull this stupid tube and give my girl some relief!! Please keep it in your prayers that she can get some sleep tonight! I gave her clonidine earlier when she was freaking out and it didn't do a thing! She NEEDS sleep! Endoscopy, Sigmoidoscopy, Impedance study/pH probe...check, check, and check! So Reagan slept "fairly" well last night! 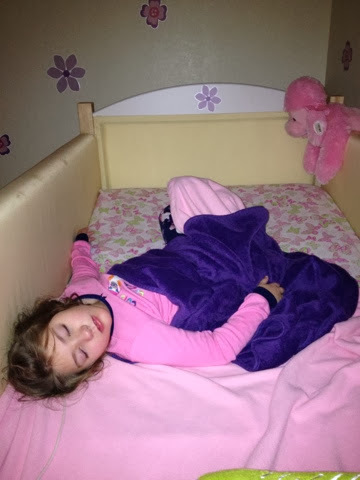 And when she did wake up, she wasn't fussing, just kicking a lot and turning sideways in her chair (which required me to jump up from bed and straighten her out). I got my hopes up that she might actually wake up OK. Unfortunately that didn't happen...but fortunately she did calm down enough for us to consider going through with the tests. I spoke with her GI doc who said he would defer to my judgement, but that a day like today (off/bad day) would be perfect for them to get in there and see what's going on with her. We decided to go through with it and braved the cold/wind (and no handicap parking spaces or valet). Reagan was not a fan of the cold air, but I dropped her and the nurse off right in front of the door, so she didn't have much exposure (boy do I miss the underground parking garages and valet in Houston)! We finally found the surgery waiting room after taking the wrong elevators and having to back track. They took us back fairly quickly but then we had a while to wait. 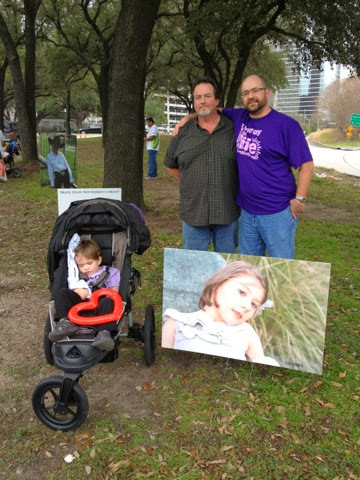 We had to be there by 11, but they didn't take her back until 1pm. They let us go back with her until she fell asleep with bubble gum gas (keeping her eyes open even after falling asleep...little creepy). Her nurse and I went up to the coffee shop on the next floor when I got a page on my pager! I took off running and eventually made my way back with my heart racing (thinking there must have been a problem with anesthesia). Turns out, one of the procedures was missing from the paperwork I had signed, so they just had to add it and get my initials! Way to give me a heart attack people! Everything went smoothly. They called us back to talk with the doctor (where they kept us waiting a little too long making me nervous once more), but he came back and said everything went well. There was one area of redness (3 red spots all next to each other) that he said "may" be a source of some discomfort. He also said there was a narrowing or potential stricture in an area, but he thinks that it would have already shown up in previous testing if that were the case. He also said there's a little irritation around her gj tube balloon and it may be worth trying a different brand of gj-tube (she has a Mickey right now). Anyway, the rest we won't know until the results of the biopsies come back and we turn in the ph probe box and they analyze that data. She was awake and fussing when we finally got back there (very unusual for her to wake up so quickly from anesthesia). She was not happy with the tube down her nose/throat (which has to stay in 24-48hrs). 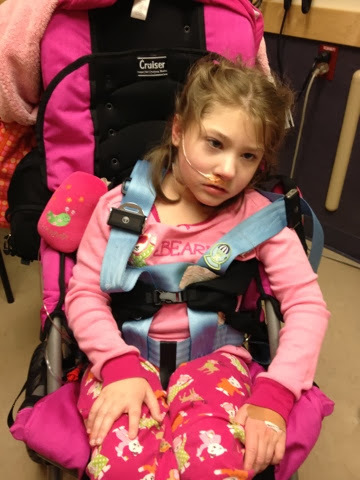 She was better once we got her disconnected from some of the monitoring devices/IV and back into her chair...but still NOT happy about that tube! 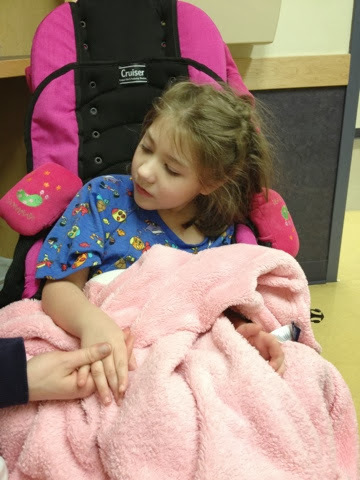 She was not sleepy after the procedure/anesthesia like we were hoping for so we've had to keep her left arm (the more accurate/active of the two) in a restraint ever since. Not sure how she's going to sleep tonight but she's dozing off right now! Hoping she can make the transition to her bed and get some decent rest tonight (without pulling out the probe)! Thank you for keeping our girl in your prayers! Reagan woke up crying this morning, turning our fears a reality. 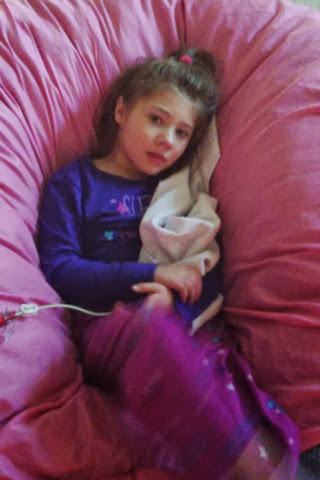 I was worried she wouldn't be able to hold out until Monday (when she's supposed to have an endoscopy, sigmoidoscopy, & impedance study)...her good days started on Monday last week (except for the nausea) and a seven day good day streak is longer than her norm lately. She settled down this morning after a dose of clonidine, but she didn't doze off, she stayed awake and quiet but very stressed. She had another major meltdown late afternoon. Crying and holding her breath til she turned purple and shaking uncontrollably! It was awful! My poor baby! She goes through so much! Considering her current condition, I'm 90% certain I'll have to cancel her procedure tomorrow! Which I really hate because she's been going three days now without nexium (and suffereing the consequences...burpy, hicuppy, and I'm sure refluxy), just to have these tests performed! But I can't justify putting her at risk by putting her under anesthesia when she's already so stressed!! Anesthesia is risky enough for a kid with mito! I really wanted to get these procedures out of the way, especially since we're meeting with the doctors this Thursday for a care conference (that includes us this time)! It's just so difficult to schedule anything like this in advance! We never know how she's going to be doing! I'm going to just play it by ear. I'll switch her over to pedialyte at 6:30am and watch her closely when she wakes up. Of course, if she's up crying throughout the night, I'm going to take that as a sign that we need to just cancel it. Hopefully we'll be able to get her back on the schedule quickly and that everything will work out in our favor next time around. Please keep her in your prayers! 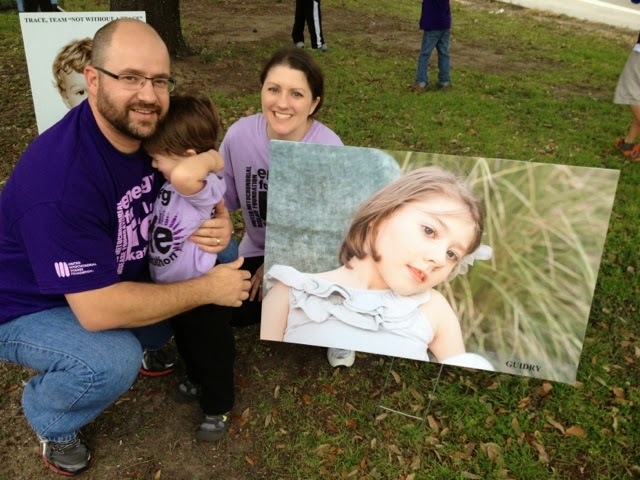 We want to have these tests done but we need to do them when it's best for her! This is how I found her this morning! Completely upside down in bed! Reagan was very restless in going down last night. Thankfully she eventually settled down (she was getting so vocal we really thought she was about to freak out) and she slept fairly well. Of course both she and her brother were up early again this morning (because who needs to sleep in on the weekends anyway)! She's had a good day again today! She woke smiling and she's been a sweet girl. She, of course, was very happy to see Grandma...and so was Ryan (who was also happy to see Grandma's dog)! We tried the eyegaze device today but Reagan was not at all into it. She didn't even want to look up at all! 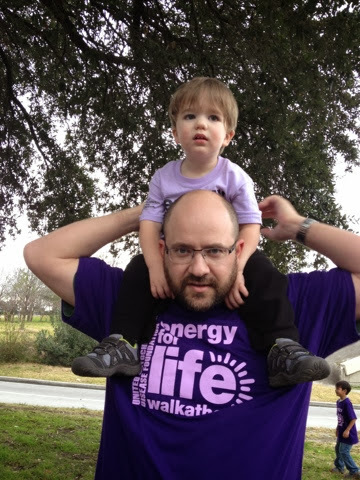 We did go for a nice little walk, since it was nice and sunny and the temp got up into the 60's. All in all, it's been a good day for my girl. She's was a little kooky at times, easily excited and not a huge fan of us talking, but so so smiley! Unfortunately I don't have all good news today. 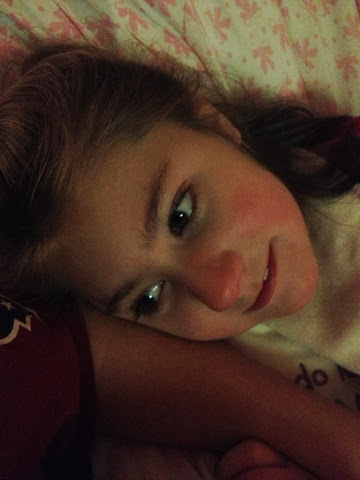 I saw a post on Lucy's blog this afternoon that simply said, "I am in disbelief, but it's time to say good-bye…" and then heard on Facebook that she did in fact pass away at 7:30pm tonight.Just short of her 6th birthday. My heart breaks for this family and this hammers home once again how desperately we need a CURE for this devastating disease. Please keep Lucy's family in your prayers! It was a good day again for my girl. She was up early, no idea what's going on with that. She was wide awake do we squeezed in an early session of OT. She did great (a while session with the eyegaze device)! Then she had speech at noon...she did great with that as well! She's been super smiley and wonderful again today! Tonight I could sense a little tension. Just a little sensitive...I can't really out my finger on it. She fell asleep with clonidine, but coughed a little as Mike was carrying her to bed. She started coughing again an hour or so later and even fussed/whined a little. I'm a little worried about her having nausea/reflux issues since we're stoping her Nexium until the endoscopy. Not sure how this is going to pan out. Please say some extra prayers for my girl! 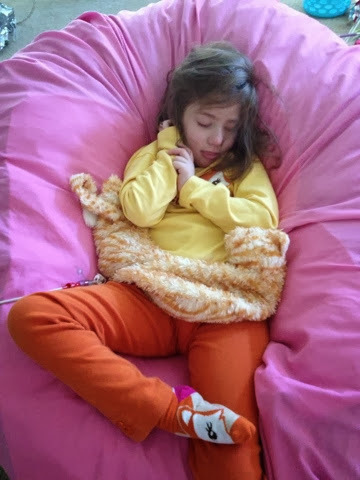 That she can fall asleep (and stay asleep) and that she continues to have good days and, God willing, get all of these procedures out of the way on Monday! Today has been better for my girl. No nausea and super sweet! She did wake up super early this morning, around 5:30am and Ryan was up by 6! These kids need to start sleeping in more, I am not a morning person! Everybody is good though! 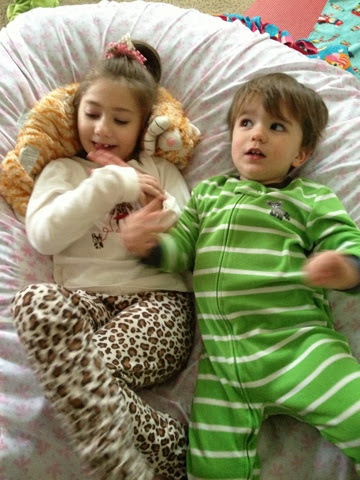 Ryan is finally over his cold like symptoms and Reagan still sounds a little congested every now and then but not much! It's nice to be able to have everyone together in one room again! Reagan had a busy day of therapy...vision, PT, & OT! She did great with everything! She's been very crunchy, with her hands twisted up in her hair nonstop, and had some temperature regulation issues (very sweaty), but otherwise great. We're really hoping she can continue on this good streak for a while longer...Grandma's coming this weekend and Reagan's got her endoscopy scheduled for Monday! So upset! I just lost a huge post on account of this stupid blogger app again (that doesn't automatically save your posts...and if you exit the app for even a second, it deletes whatever you were working on)!! Ugh! Reagan had a good, busy day today. She and her brother were both up by 6am. She had an early session of OT, followed by speech, and then casting for new AFOs. She's been great, super sweet and smiley, but she's had unsuspecting bursts of nausea throughout the day. When I say unsuspecting, I mean she wasn't showing any of her typical signs (increased saliva, lip smacking, retching...none of that). She had one throw up this morning, one this afternoon, and four tonight. There were a couple times tonight that she would get hiccupy or burpy beforehand, but not every time. Poor thing! Please keep her in your prayers that she'll sleep it off tonight and wake up 100% tomorrow! I hate to see anything like this infringing on her good days (not sure if its the decrease in Nortriptyline, the formula change to Elecare jr, or something else)!! I'm going to start this post with a little blog education. 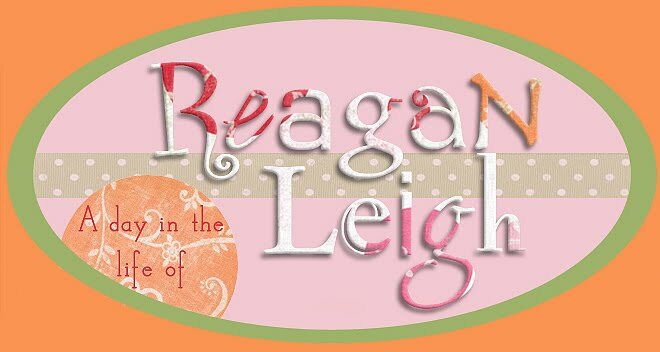 This blog is intended just as the name implies...A Day in the Life of Reagan Leigh. It's a journal that chronicles Reagan's day to day life. It's a tool for myself and others to use to see how she responded to certain medications, when certain symptoms first appeared, when procedures occurred. 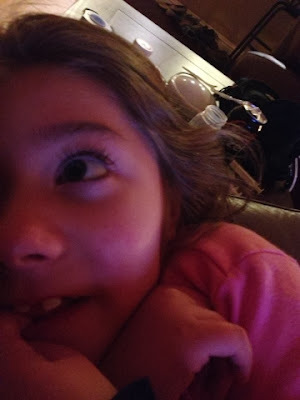 I can't tell you how many times I've gone back to the blog to look up a date of a procedure or to map out good/bad days (which we just did for her neurologist). 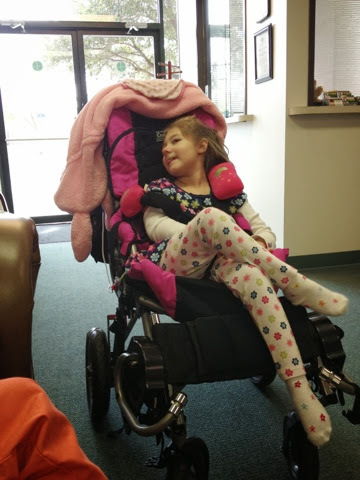 I've also been told by many parents how helpful it was for them to see how Reagan responded to a certain medication or therapy (in helping them look for symptoms in their own child or decide on which medication to try). I also write it for our friends and family. 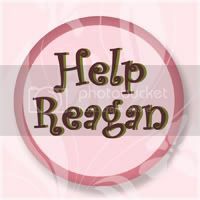 Many of whom are long distance and want to know how Reagan is doing and enjoy seeing new pictures of her and her brother. And lastly, to vent. 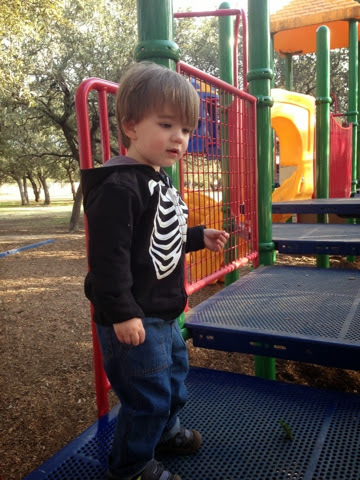 There are days that it's unbearable to watch my child suffer one second longer and on those days I can express my frustration on the blog and ask for prayers! But the blog is not here for me to pretend that everything is always hunkey dorey and that we are this picture perfect family (that is what Facebook is for)!! So, for better or for worse, this is A Day in the Life of Reagan Leigh! On to my girl's day...She had a great day today! She slept like a rock after the clonidine last night and didn't wake up until we had to get her dressed for her neurology appt! Thankfully, when she woke up she was all smiles and no longer nauseous (seriously, thank God)! She was super sweet and so well behaved for her appt...wish I could say the same for her brother! Not a lot to report from the appt. Mike helped me make a bar chart that showed good/bad days, sleep, Lyrica dosage. Needless to say, there wasn't much of a change. There are definite highs and lows (that come in waves), but there doesn't appear to be much of a difference since adding the Lyrica. So...we're taking her off of it (it was a slow wean on, and it will be a slow wean off). Meanwhile, we're waiting to discuss any future changes until we get the results back from the endoscopy/pH impedence study/ sigmoidoscopy scheduled for next Monday. 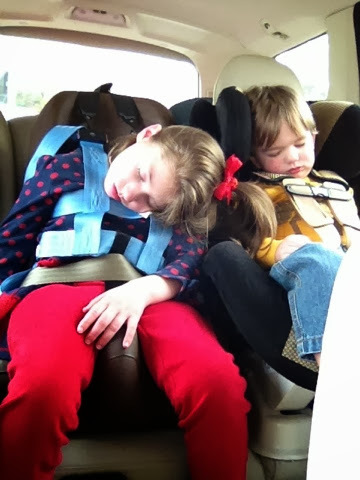 Reagan and Ryan both fell asleep in the car on the way home! They were alternating snores...it was too cute! Reagan continued sleeping once we got home and slept straight through PT. That was OK because it allowed her therapist to get some good stretching done. She woke up in time for a bath and lots of snuggling with mommy tonight! Such a sweetie!! Love this girl!! 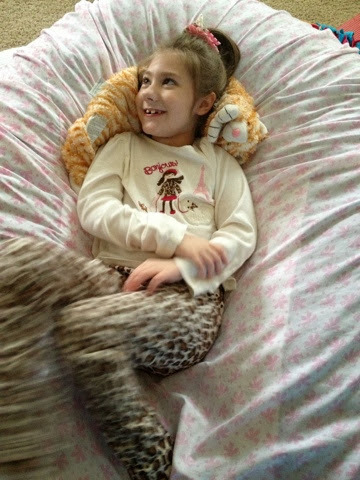 Reagan slept like a rock last night in her bean bag chair...and when she woke up this morning, she was all smiles and so sweet! And despite her wonderful demeanor, it has not been a good day for my girl. She's been good, could not have been better, but the nausea started up around noon and has progressively gotten worse and worse as the day has gone on. Tonight it was relentless! She's nauseous, so she's super spitty, like a faucet. But she holds it in (for whatever reason), cupping her lips so that it doesn't drip out. So it just accumulates in her mouth until she's literally drowning in her own spit! And she's coughing/gagging/choking on it! We're talking nonstop! It's awful! I tried a dose of Ativan tonight (we've never tried it for nausea), it didnt help at all, only made her a little drowsy, but not drowsy enough to fall asleep. Finally I gave her clonidine and she dozed off. I'm praying she'll stay asleep and wake up with smiles minus the nausea! Please keep this in your prayers! Reagan didn't sleep much last night. It's been another long day for my girl. This morning it seemed maybe she had turned a corner, she was even giving us some laughs! But right around noon or so, she started freaking out again! Very agitated, inconsolable crying. We tried everything we could think of, but she wasn't getting any better. She'd doze off here and there but her body was definitely fighting against her. And she was swiping at her face/nose nonstop! 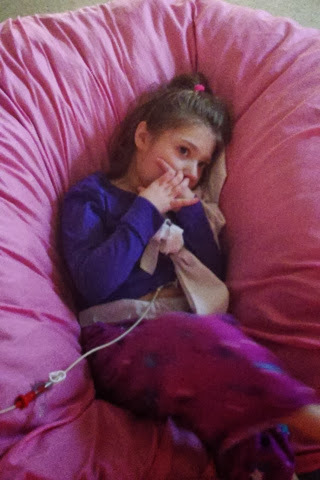 Finally her nurse put on her arm restraint again and it seemed to settle her down a little (I don't think she can control herself...she doesn't WANT to rub her nose raw, she just can't stop)! And she was bitey yesterday so she's got several marks on her left arm from those teeth! She settled down again and we even brought her down to watch the Super Bowl! But again, as time went on, she started getting agitated! I took her back upstairs and tried to get her to settle down and go to sleep. I gave her clonidine, and if anything, she got more agitated! Mike came up and held her cradled on her bean bag chair and she finally fell asleep! She did wake back up again, but I was able to cradle her and get her back to sleep. She's out right now so hopefully she stays that way...she SO needs it! 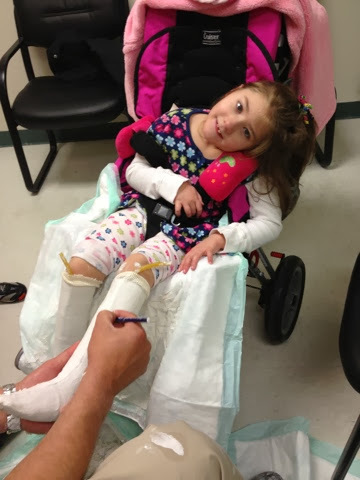 To say that it's been a bad day for Reagan is a huge understatement (as I'm sure her nurse would be happy to attest)! 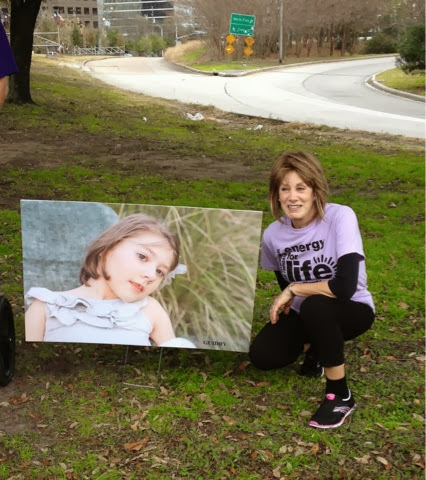 I wasn't sure where she was headed and if we should attempt taking her to Houston for the walkathon, but after last night, the answer was crystal clear! Reagan woke up crying around 2am and then has been crying on and off (mostly on) ever since! There was a small period this morning when her nurse first got here where it seemed like she was feeling a little better. But an hour or two after we left, she started crying and then didn't stop! She's been on round the clock alternating doses of clonidine and Lortab and sometimes they help a little and sometimes they do nothing at all! It's just SO frustrating! 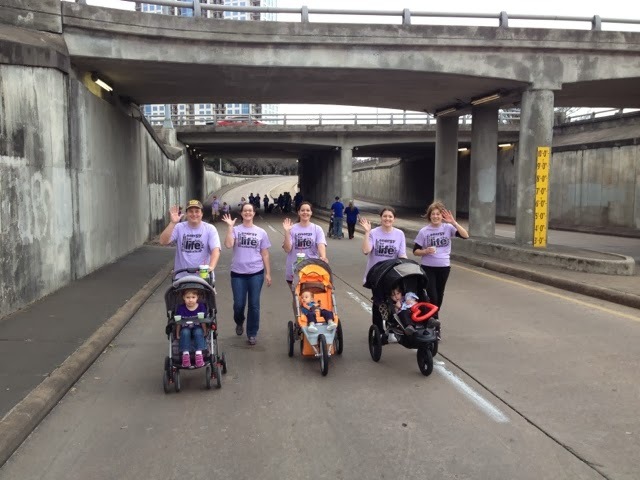 We felt awful leaving our nurse behind with her, but we had a whole team of walkers waiting for us in Houston for the 2014 UMDF Energy for Life Houston walkathon! 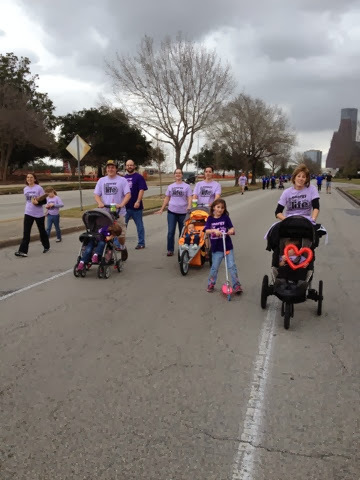 It was a long day of driving, but I'm so glad we were able to make it to see all of our Houston friends and family and help raise money and awareness for mitochondrial disease in honor of our beautiful girl! Praying that somehow, someway she can get some rest tonight and feel better ASAP!